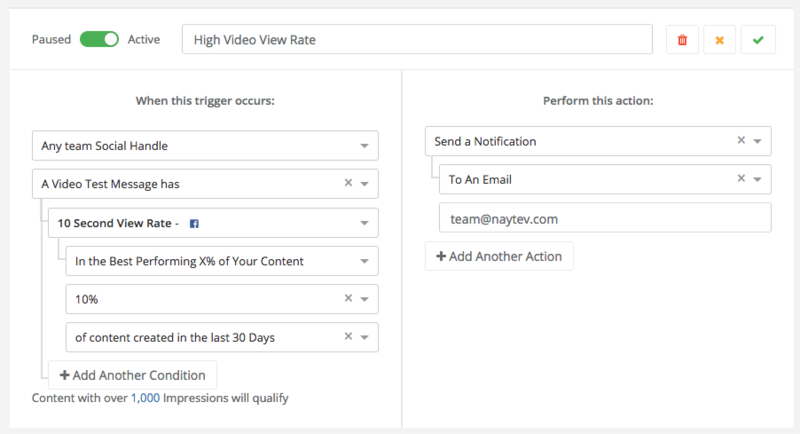 Naytev's Automation and Alert solution enables your team to automatically take data-driven actions for your social content across Facebook, Instagram, Twitter, LinkedIn, and Pinterest. Easily streamline team communication, celebrate high performing content, identify content that needs improvement, better manage paid promotion, and more. Each automation, or "Trigger", includes (1) trigger conditions, and (2) trigger actions. When your specified conditions are met, Naytev takes your specified actions. Starting from the moment you create the trigger and moving forward, if eligible content surpasses your performance thresholds, Naytev will take your specified actions. For example, a piece of content that exceeded your threshold 1 week before you activated the Trigger will not result in any actions from that Trigger. 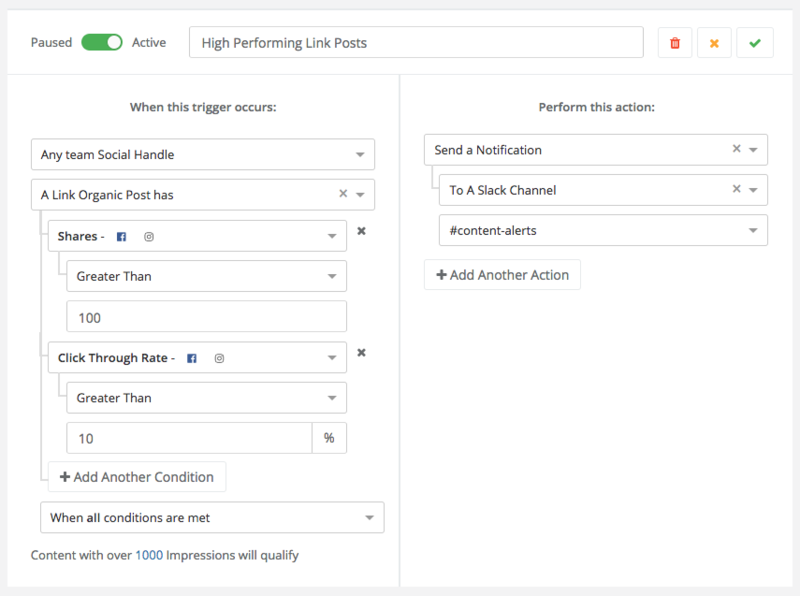 You can set Triggers based on (1) team social handle; (2) content sources like organic posts, test posts, and tests; and (3) content types like image, link and video posts. You can also pick from a rich set of key performance indicators, from fixed engagement values (e.g. total comments, clicks, conversions), to rates of engagement (e.g. click-through rate, view rate, conversion rate, etc. ), to engagement costs (e.g. cost per click, cost per acquisition, cost per view, etc.). The first action we're releasing is the ability to automatically notify you by email or slack channel when your conditions are met. We will soon support more actions, like automatically boost a post, pause a promotion, or recirculate content.